The tendency towards self-interest and an increasingly commercial orientation in accounting, together with a string of business and accounting scandals, brings the professional status of accounting into question. This chapter explores the how a renewed sense of professionalism within accounting may lead to greater recognition of the social within accounting. Positioned at the margins of accounting, social accounting includes emergent technologies of social accounting, focusing on silent, shadow, and counter accounting that expose values and priorities, challenge accepted understandings, generate new visibilities, and highlight the perspectives of neglected and marginalised segments of society. 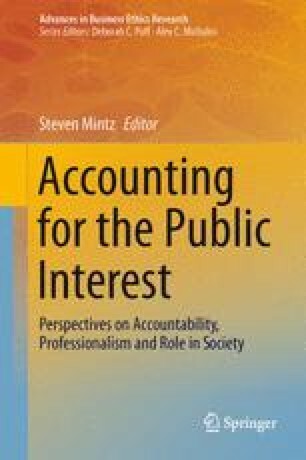 In so doing, social accounting may provide an important means for addressing the public interest agenda in accounting, and for strengthening the relationship between accounting and the public interest.